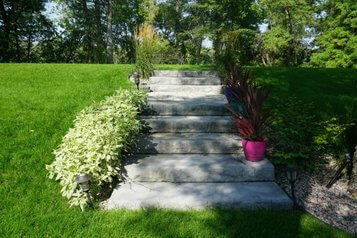 Viking landscaping Inc is a family owned and operated company. We have been operating as a landscaping company since 2005 and provide an all-encompassing design and landscaping construction service to our clients. Our landscaping team of accomplished landscape designers and skilled stonemasons will create an exceptional product based on your exact specifications. At Viking landscaping Inc we are committed to providing our customers with great quality work and equally as great customer service with great pricing. Calgary sits in the sunny eastern foothills of Canada’s Rocky Mountains, where the Bow and Elbow rivers meet. With great scenery and in some neighborhoods a view of the Rocky Mountains Calgarians enjoy spending time in their backyards. A lot of Calgarians are renovating their yards to create a space of relaxation and enjoyment for their families. At Viking Landscaping Inc we have the expertise to create these yards for families to enjoy. Irrigation systems are used to artificially provide your land with water. Our systems will help maintain your lawns rich green color and will help maintain anything that you are growing on your property. We can install an automatic irrigation system in different zones that will water each zone at scheduled times or at the same time and place the sprinkler system evenly around your property to distribute the water. Once it starts raining you won’t have to worry about shutting the system off as it comes with an automatic rain sensor. You will have one less thing to worry about knowing your lawn is being taken care of without you having to water it yourself. We have a wide selection of different paving stone designs for you to select. Paving stones are an easy addition to any yard, and laying patio pavers can take about a couple of days to complete. 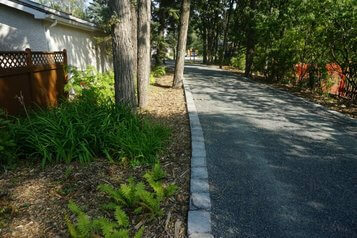 Our landscaping team will lay out the design, setting elevations and excavating where necessary. We will then excavate the area to a minimum depth of 6” and then level and power compact it. Finally, we will lay down the pavers on screeted bedding material. Trees and shrubs form the framework of your landscape. Their beauty, shape, size, foliage, and flowers are important elements of a welcoming and inviting space in which to enjoy. On mature trees, pruning is required to remove dead and dying branches to maintain plant health and safety. This pruning type is referred to as cleaning. Lower branches will also require pruning. 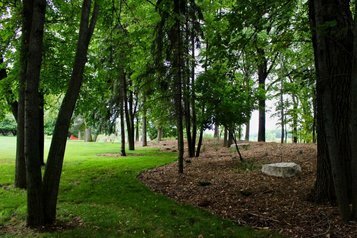 This process, known as raising, also can be used to increase the amount of light for turfgrass and ground covers beneath the crown of a tree.